High Efficiency HVAC equipment is increasingly favoured by homeowners in Toronto for their energy saving parameters and better performance capabilities. 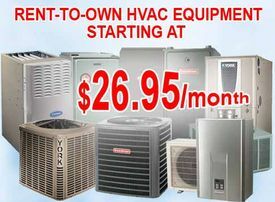 The HVAC contractors Toronto deal is rental where selling and installing come along with repair services. HVAC contractors supply units of various sizes and capacities that can be paired with existing ducts and centralized heating and Air conditioning systems. Before contacting an HVAC contractor, here are some basic pointers that will help you get your job done smoothly and effectively. HVAC service providers have to work with units that may cause hazard if installed not properly. The heating and cooling system are complex systems used indoors. It requires training and expertise when it comes to dealing with heating and cooling systems. Apart from toxic ingredients present in the compressor, there are inherent safety issues that could arise due to electricity, natural gas and oil. Choose a contractor with at least 7 years of experience in installation and repair of HVAC system. An HVAC contractor with sufficient experience and training ensures you enjoy excellent air quality, comfort and safety. Always ask a professional HVAC contractor service about references. A respectable client list reflects professional approach and you can also verify the quality of work contacting some of customers. You can refer to client’s review when it comes to discipline and servicing at regular intervals. After all you should not be the one suffering for a contractor’s shoddy work, even as you paid unreasonable fee for the service. Get the estimates in a documented form for future reference and FREE of charge. In some cases, HVAC contractors may be hired for bulk orders. It could involve working with multiple brands or same systems. The same system bundle would cost less and entitle you for maximum government rebate if any one applicable. In any case, bulk installations and repair cost could be negotiated before job started. Payment schedule might include paying advance. Registered HVAC contractors and service providers offer a finance plan with credit options as well. Make sure you read the payment schedule well in advance before signing agreement with contractor for bulk operations. HVAC systems may need service and maintenance during operation period especially if you are dealing with old systems. HVAC contractors offering service contracts along with after sales incentives are invariably the most preferred ones. It ensures that your HVAC gets a scheduled repair and maintenance as per a regular visit by the professionals.